When I started my job as Asia desk editor of FT Deutschland in February 2003, the crisis over North Korea’s nuclear activities became my personal crisis. I had hoped to flaunt my knowledge about China in my first weeks on the job, but instead I had to write my first commentary for FTD about nuclear diplomacy in East Asia. I started reading, called U.S. experts and talked to South Korean diplomats in Berlin. In the summer, I told my editors that I finally had to see the place. So I flew to Seoul in time for the 50th anniversary of the armistice that divided Korea along the 38th parallel and I joined the U.S. troops on a bus trip to the ceremony with Korean War veterans in Panmunjom in the demilitarized zone. I wrote a feature story about a South Korean veteran who did not join any celebrations on that day in protest of his government’s Sunshine policy of rapprochement with the North. Juche Tower in Pyongyang, 2007. In June 2004, I finally got a chance to see the North. I joined a group of German parliamentarians on their way to Pyongyang. From the Koryo Hotel we could walk the streets of North Korea’s drab capital, but our local minders made sure we did not get far on our own. They kept us busy by showing us the sights: The colossal statue of the country’s founder Kim Il-Sung. The Juche Tower (named after Kim’s ideology), which is always lit at night even when normal households have no electricity. We went to the official Department Store Number One, but also to one of the newly opened markets, where farmers could sell a portion of their produce in a cautious experiment with capitalism. The German aid organization Welthungerhilfe took us on a daytrip to the countryside where people were so desperate they grew vegetables on their roofs. Back in Pyongyang, a colleague and I visited with Günter and Barbara Unterbeck, the former East German diplomats who had stayed on in Pyongyang after the end of the Cold War in Europe. We also pulled off a nightly excursion to a karaoke club for expats (when we came back to the hotel, our minders were not amused). We were the only guests, but the employees opened the club for the two unannounced Western ladies and offered us – Coca-Cola! It turned out to be a surreal evening which culminated in our singing “Surfin’ USA” together with the North Korean hostesses. 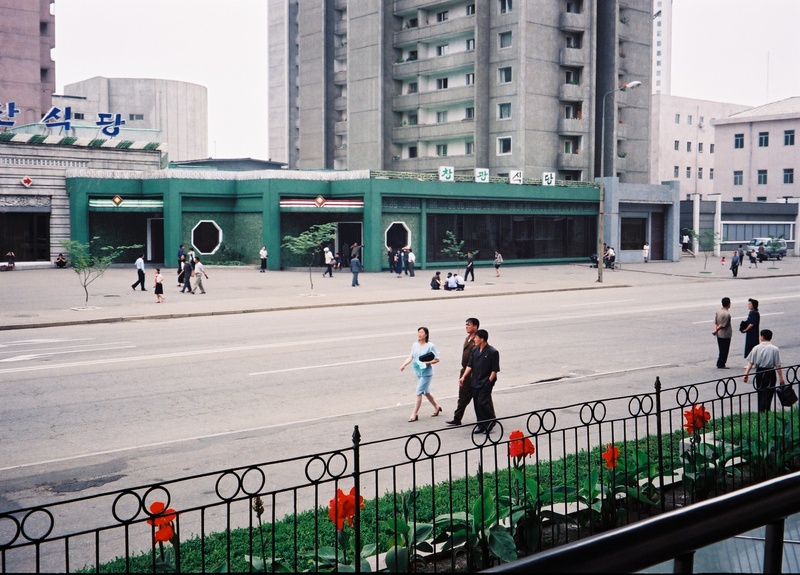 After the trip I wrote a feature story about the whiff of freedom in Pyongyang during those days. 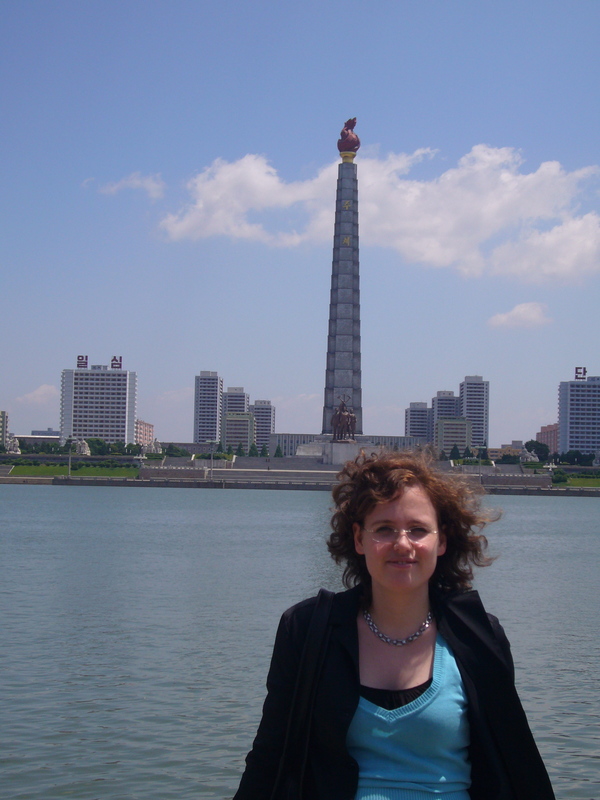 I visited North Korea one more time in 2007 on my last trip to Asia before I switched continents and moved to the U.S. This time, we drove to Kaesong, the Special Economic Zone at the South Korean border. 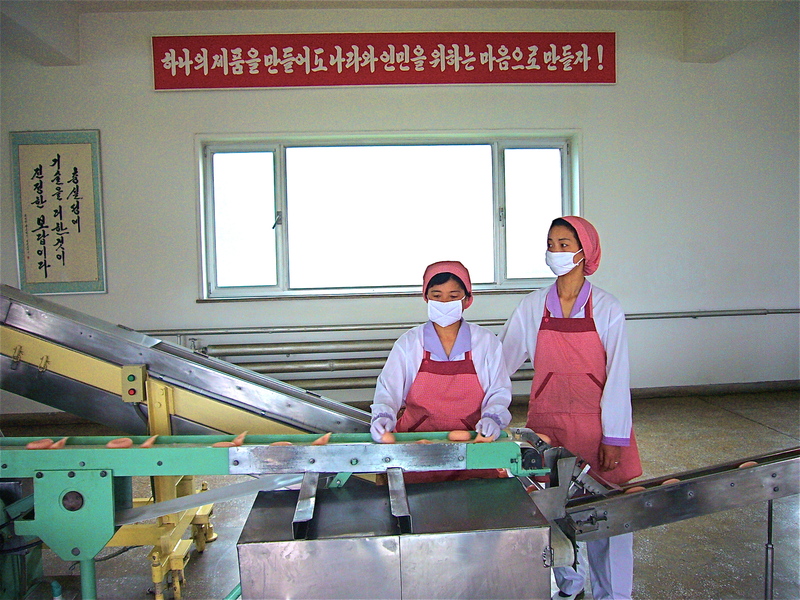 In Pyongyang, we saw a soap factory that seemed too tidy to be real and a new IT center whose employees claimed to have developed a North Korean version of Windows. We saw the Juche tower once again and caught up with the Unterbecks. This time, the minders did not let us sneak away. This entry was posted in The Five Asia Years and tagged Financial Times Deutschland, FT Deutschland, media crisis, North Korea, Sabine Muscat. Bookmark the permalink. When I hear talk show hosts, or U.S. citizens in their own political debates on the Net (and from both the right & left), call our own government a “regime”, I think of the kinds of things you witnessed during this trip, Sabine. The U.S. government is NOT totalitarian: North Korea’s government IS. Thanks for sharing these experiences with us, Sabine.